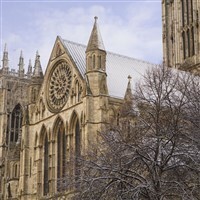 Enjoy free time either sightseeing/ shopping around the Cathedral City of York. Just minutes outside historic York in a beautiful landscaped garden setting, York Designer Outlet is a must-visit fashion and shopping destination. The indoor shopping centre is home to over 120 leading UK and international designer and high street brands including Coach, Reiss, Ted Baker, Lacoste, Dr. Martens, Superdry and Molton Brown all at up to 60% less. A contemporary Food Quarter offers shoppers the perfect setting for a quick coffee or relaxed lunch during their shopping trip. Highlights include Pizza Express for classic Italian dishes, freshly made sandwiches and salads from Pret a Manger and Fishermans Wife for traditional fish and chips. Eden Camp opened as a museum over 30 years ago in 1987. Since then, with the help and support of our visitors we have grown into one of the largest and most comprehensive museums covering British military and social history from 1914 onwards. Enjoy exploring our Riverside 1 entertainment zone, the swashbuckling world of Zanzibar and the prehistoric plains of Dino-Stone Park and were sure youll agree that our Theme Park has something for all ages to enjoy. If youre looking for adrenaline-fuelled thrills, then eight extreme rides are waiting just for you, including the record-breaking Mumbo Jumbo, Hero, Pterodactyl and firm Flamingo Land favourite, Kumali. A captivating programme of inclusive live shows, including Pirates of Zanzibar with its breathtaking acrobatics, swordplay and magic, guarantees that the fun never stops. Excitement and adventure for youngest guests is also assured by regular appearances from Peter Rabbit, Lily Bobtail and Benjamin Bunny, a fantastic collection of junior coasters and carousels, plus indoor soft play areas too! We are sure to feed your appetite for fun, but theres also a superb selection of restaurants, cafés and bars that are guaranteed to satisfy your hunger! During your visit, enjoy a fine selection of takeaway foods including the famous Jolly Sailor fish & chips, gourmet burgers and freshly baked pizza. With a range of cafes throughout the Theme Park, you are never far away from a sweet treat or a hearty meal. With Costa and Starbucks Coffee, freshly baked and filled baguettes, sweet and savoury pastries and delicious freshly baked muffins, we are sure you will be spoilt for choice. Flamingo Land has a fantastic choice of restaurants too, from Upper Deck, The Mansion House and Metropolis Bar & Grill, to The Diner, Fabrizios and The Coach House, the traditional country pub. Here you can enjoy great food and great service, with many dishes freshly prepared from locally sourced produce. Finally, if you simply fancy a chilled lager, traditional hand-pulled ale, wine or even something stronger, all the main restaurants are fully licensed, plus theres Pitchers, the unique sports bar, waiting just for you.